10k Route: The course begins on the upper pathway and heading north for approximately 1km before turning back onto the lower perimeter road. It then continues back to the race village for approximately 1.5km followed by one complete clockwise lap of the reservoir. The race, predominantly on tarmac pathway but including loose gravel in places, is suitable for runners of all abilities. Half Marathon Route: The course begins close to the south-west corner of the reservoir. The route follows the lower perimeter road clockwise back to the race village followed by two complete laps of the reservoir. The race, predominantly on tarmac pathway but including loose gravel in places, is suitable for runners of all abilities. It was a well organised event and works well with the 10k starting at the same time over the other side of the lake. The course is a little hilly but nothing too excessive. 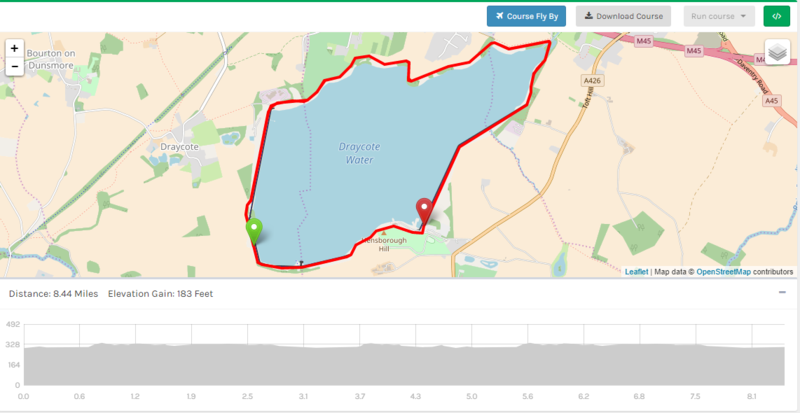 It is a shame we have to run on the lower path/roadway below the edge of the reservoir so you do not get the cooling effect of running next to the water but I understand that path is too narrow and there are other people enjoying Draycote. The wooded sections of the course are nice and give you some shade and views of the lake. Despite it not being the middle of a town or city there was some nice support from the people having a day out there. Hello, you will receive a finisher medal and the race is timed using chip timing. There are also water stations along the run route and you will receive a goody bag at the end of the race. Have a good race!